I have decided that I will be putting up at least 4 step by step tutorials every month mostly of nail art and sometimes I’ll throw in some DIY tutorials as well! Starting this month with a nail art! And the theme is perfect for this month! My first nail art tutorial this year for St. Valentine’s Day! And I will be doing two more! Though this nail art did not turn out like I wanted it to, thanks to my war with Hearts, I will still share how I did this! You will basically need three shades of nail color, Red(obviously! ), pale yellow , two shades of green , one darker and another one lighter. 1. Always start off with painting your nail with a base coat, and then apply the base color. I am using a pale yellow as base color from Stay Quirky called Electric sensation. 2.Using a kitchen sponge, deposit the light green shade at the tip of your nails. Make sure you use a porous sponge for the effect of grass. 3. Draw stems of different sizes for the heart flowers, using the dark green. 4. On the longer stems draw the hearts as flowers, I have tried drawing the hearts using a doting tool (need loads of practice on that). You can do however you like! 5. On the smaller stems, apply red sequins, I have used the red sequins from Maybelline Go Graffiti Red splatter. If you do not have red sequins or glitters, you can simply add dots instead with a red color. 6.Finish off with a top coat, clean your cuticles and nails and you’re done! And try not to sleep before it dries completely! Don’t do what I did *Hides face* !!! 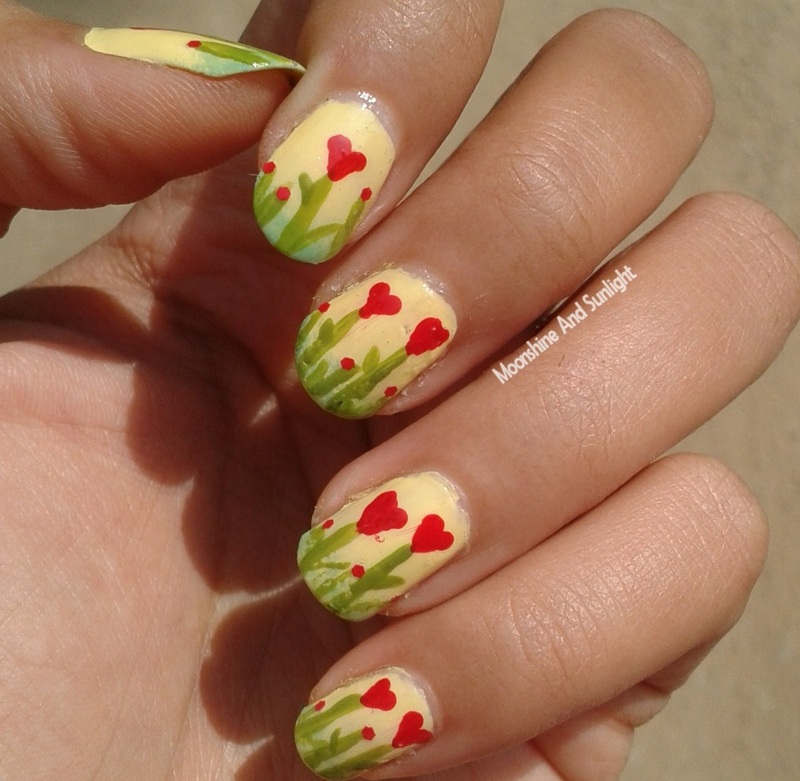 This is a very cute and fun nail art to wear during the Valentine’s Day season! I hope you like these step by step tutorial that I have started making! Let me know in the comments how can I improve these as well ! Hope you try this out! See you next time!